A privately built robotic cargo ship has been cleared to link up with the International Space Station early Sunday (March 3) after a review by its builders and NASA. The cargo ship's arrival will be one day later than planned due to a thruster issue, since fixed, that cropped up shortly after its Friday launch. The unmanned Dragon space capsule, built by the SpaceX spaceflight company, is on track to be captured by the space station's robotic arm at 6:31 a.m. EST (1131 GMT) and attached to an open docking port shortly afterward. The cargo ship is hauling 1,200 pounds (544 kilograms) of food, experiments and other supplies for the station's six-man crew. "Just received #Dragon docking clearance from @NASA," SpaceX CEO and founder Elon Musk wrote in a Twitter post today. "Will begin orbital maneuvers to Space Station at 11pm Pacific time." NASA will broadcast live views of the Dragon rendezvous at the space station beginning at 3:30 a.m. EST (0800 GMT). You can watch NASA's SpaceX Dragon docking webcast on SPACE.com courtesy of NASA TV. SpaceX's Dragon space capsule mission is the company's third flight to the International Space Station and second official resupply flight for NASA under a $1.6 billion cargo delivery contract. In all, SpaceX plans to launch 12 missions to the space station under the deal. After several hours of troubleshooting, SpaceX officials solved the thruster problem and activated all four thruster pods, but the time required for the fix forced the Dragon to miss its planned Saturday morning docking at the space station. Now, with all 18 Draco thrusters on the Dragon's four thruster pods working, SpaceX is ready to attempt the rendezvous. "SpaceX said it has high confidence there will be no repeat of the thruster problem during rendezvous, including its capability to perform an abort, should that be required," NASA officials said in an update. Two NASA astronauts — station commander Kevin Ford and flight engineer Thomas Marshburn — will oversee the capture of the Dragon spacecraft using the station's robotic arm at about 6:01 a.m. EST. Canadian astronaut Chris Hadfield will use the arm to attach the Dragon capsule to a docking port on the station's Harmony connecting module later in the morning. Three Russian cosmonauts round out the station's current Expedition 34 crew. The astronauts are expected to open the hatches between the International Space Station and Dragon capsule one day after its arrival. The Dragon capsule will be detached from the station and released on March 25 so it can re-enter Earth's atmosphere and splash down in the Pacific Ocean, off the coast of Baja California. The capsule will be retrieved by a SpaceX recovery crew. It is expected to return about 2,700 pounds (1,210 kg) of experiments and other gear to Earth for NASA. The other company, Orbital Sciences Corp. of Dulles, Va., has a $1.9 billion contract for eight cargo shipments using its Antares rocket and Cygnus spacecraft. Orbital Sciences is planning to launch its first test flight of the new rocket and spacecraft later this year. NASA retired its space shuttle fleet in 2011 and has since been dependent on Russian Soyuz spacecraft to fly American astronauts to and from the International Space Station. Until SpaceX's first cargo mission last year, the U.S. space agency was also dependent on robotic cargo ships built by Russia, Europe and Japan to send supplies and experiments to the space station. SpaceX is one of four companies vying for NASA funding to develop manned spacecraft capable of launching American astronauts to the space station and returning them home. SpaceX has received about $440 million in NASA funding to modify its Dragon design and Falcon 9 rockets to carry crews of seven astronauts into low-Earth orbit. 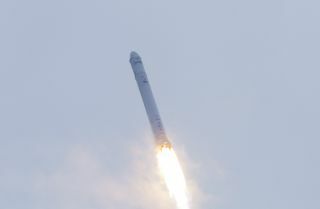 SpaceX officials said they expect to launch the first crewed mission of a Dragon spacecraft in 2015. Visit SPACE.com for complete coverage of SpaceX's Dragon mission to the International Space Station. This story was updated at 8:35 p.m. EST (0135 March 3) to reflect a new grapple time for the SpaceX Dragon capsule. You can follow SPACE.com Managing Editor Tariq Malik on Twitter @tariqjmalik. Follow SPACE.com on Twitter @Spacedotcom. We're also on Facebook & Google+. This article was first published on SPACE.com.